Racing technology at a reasonable price. Honda built its first V4 engine in 1981. By 1985, the 750 VFR had quickly established itself as one of the best sporting bikes of its day by combining extremely elegant lines with leading-edge technology that had previously been the exclusive domain of the competition department. The VFR's liquid-cooled twin-cam V4 engine had a valve gear operated by a train of gears, and its frame was a double-beam structure in cast aluminum. In 1990 the VFR began a new career, once again using techniques pioneered on the racetrack, such as a single aluminum rear suspension arm. Its appearance had been carefully reworked; for example, it now had twin headlamps. Sporting without going over the top and comfortable for two riders (a rare quality), the VFR was virtually without a rival in its class - the other models on the market were more "touring" in nature, with bigger engines, or else they were more extreme dedicated sports bikes. Launched virtually at its peak of development, the VFR 750 has stayed at the leading edge of technology with only detail modifications, such as a tinted windscreen and new developments in suspension control. 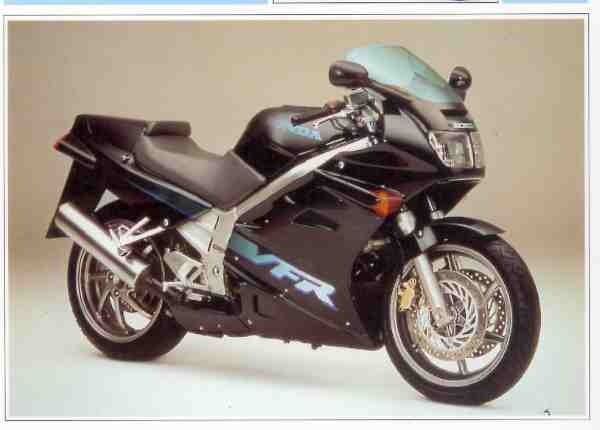 The VFR 750 F has retained virtually the same silhouette since its launch in 1985, though there are many detail differences between the original model and this 1992 version.